At head of title: Better homes and gardens. Includes index. My grandma passed her cook book down to my mom who in turned passed it down to me. Now, it's put away to be passed down to my daughter. I have referred to back to this cook book so many times I've lost count over the years, and it's pages are so old they are almost unreadable. I love it and want to find another one that's still in good shape. 1976-07-06. New. Ships with Tracking Number! INTERNATIONAL WORLDWIDE Shipping available. Buy with confidence, excellent customer service! Better Homes & Gardens Books, 1999. Binder. As New. 3-ring style notebook. This book is in as new to new condition. It appears to have not had use. Better Homes and Gardens, 2005-08-16. 6. Ring-bound. Used:Good. 1996-07-04. New. Ships with Tracking Number! INTERNATIONAL WORLDWIDE Shipping available. Buy with confidence, excellent customer service! 1981-08-01. New. Ships with Tracking Number! INTERNATIONAL WORLDWIDE Shipping available. Buy with confidence, excellent customer service! Wiley, 2007-10-23. 14. Cards. Used:Good. 2007-03-07. New. Ships with Tracking Number! INTERNATIONAL WORLDWIDE Shipping available. Buy with confidence, excellent customer service! Meredith Publishing Company, 1953. First THUS. Ring-bound. Very Good. Very Good + BONUSES (scroll down)NOTE following conditions: Cover is old showing its age with some corners and/or spine edge slight fraying, back cover has mark from use, Index pages some are loose (needs retagged) also ends on page 412 (middle S). in first tab Meal-Planning and Nutrition starts on page 7. Has additional recipe article clip outs from prior owner. PLEASE ASK FOR PHOTOS IF NEEDED. A copy that has been read, but remains in excellent condition. Pages are intact and are not marred by notes or highlighting. The spine remains undamaged. ***** 3 FREE EXTRA BONUSES: #1 BH&G Cooking With Whole Grains (hardcover), #2 BH&G Oriental Cook Book (hardcover); #3 BH&G All-Time Favorite Pies (hardcover). ***** *****MY SHIPPING PLEDGE ***** Orders placed by 4pm CST will be shipped same day. Shipments are packaged by ex-shipping dept., head inside fluted and/or box board. Any other requirements from you, please contact us immediately. Meredith Press ,, 1965.. Ring-bound. LIKE NEW. Like new. This is the 1965 revised edition, 8th printing. Oversize red and white check cover with white title lettering within three black kitchen recepticles (pressure cooker, gravy boat, covered frypan); 5-ring binder, yellow chapter dividers. As new but pages a little tanned due to age. No marks or writing. OVERSIZE. **We provide professional service and individual attention to your order, daily shipments, and sturdy packaging. FREE TRACKING ON ALL SHIPMENTS WITHIN USA. Better Homes & Gardens, 2012-04-10. 15th. Spiral-bound. Used:Good. Better Homes and Gardens Books, 1996-08-01. Ring-bound. Used:Good. 1996-07-04. Good. Ships with Tracking Number! INTERNATIONAL WORLDWIDE Shipping available. May not contain Access Codes or Supplements. May be ex-library. Shipping & Handling by region. Buy with confidence, excellent customer service! 1976-07-06. Good. Ships with Tracking Number! INTERNATIONAL WORLDWIDE Shipping available. May not contain Access Codes or Supplements. May be ex-library. Shipping & Handling by region. Buy with confidence, excellent customer service! Wiley, 2006-09-12. 14. Ring-bound. Used:Good. Better Homes and Gardens, 2002-09-01. 12. Paperback. Used:Good. 1981-08-01. Good. Ships with Tracking Number! INTERNATIONAL WORLDWIDE Shipping available. May not contain Access Codes or Supplements. May be ex-library. Shipping & Handling by region. Buy with confidence, excellent customer service! Wiley, 2007-09-04. 14. Plastic Comb. Used:Good. Better Homes and Gardens Books, 1996-08-01. 11th. Paperback. Used:Good. Meredith Press. Cover Is Loose From The 5 Ring Binder Been Taped Back In Place. Few Of The Pages Are Loose From The Metal Rings. Well Used Cookbook, Has Notes And Comments From The Previous Owner In It. . Poor. 3 Ring Binders. 1st Edition. 1953. Wiley, 2007-10-02. Limited Edition. Ring-bound. Used:Good. Meredith Publishing Company, 2005-08-16. Ring-bound. Good. Wiley, 2006-09-12. 14. Paperback. Used:Good. Better Homes and Gardens Books, 1996-08. Paperback. Very Good. Nice looking book, has minor edge wear. Des Moines, IA: Better Homes & Gardens Books, 1995. 2nd Case-Bnd Ed 11Pr. Some chipping to outer edges of loose endpapers, overall content in excellent condition. Hardbound. 4to. 480 Pgs.. Nr Fine. Better Homes & Gardens New Cook Book written & published by Better Homes & Gardens Books, Des Moines, IA. 2nd Case-Bound Ed 11th Pr. Hardbound, no DJ. Size 4to (up to 12'' tall). Condition: Nr Fine. Some chipping to outer edges of loose endpapers, overall content in excellent condition. 480 Pgs. ISBN 0696008912. This new Edition is the best yet, with hundreds of all-new recipes and a fresh, contemporary style. Plenty of new chapters have been added to meet the needs of today's everyday cooks, including new chapters on breakfast and brunch, casseroles, and convenience cooking. 1,000 photos accompany this wide selection of recipes, which cover everything from Pad Thai to a Thanksgiving turkey. New Features include: icons that call out fast, healthy, or classic dishes; an expanded and revised chapter on canning and freezing foods; and new chapters on pizza, sandwiches, wraps, and more. Presents more than 1,200 recipes, including 750 brand new to this edition. More than 800 helpful step-by-step, how-to images and photos. New suggestions for personalizing family dinners, new twists on favorite dishes, and plenty of recipes that yield leftovers you can use again in other recipes. Description text copyright 2011 www.BooksForComfort.com. Item ID 24612. Meredith Publishing Company, 1965-01-01. Spiral-bound. Acceptable. Acceptable to good condition from 1965. Well loved and well used. Some smudging/staining and wear on the covers. Ring bound. Clean inside pages. Binding is good overall. Still a collector's item for one to carry on its traditions. Protected in plastic sleeve. Fast shipping! Meredith Publishing, 1968. Spiralbound. Good. No dust jacket. edge wear corners bumped. 400 p. Includes illustrations. Hardcover w/ 5-ring binder. extra pages from magazines have been added! ! NY: Meredith. VG ring binder. (1978). 5th ptg. Beautiful condition. All the recipes you don't remember where you got them are all here. . Better Homes & Gardens Books. Fine. 1981. Ninth Edition; Third Printing. Hardcover. 0696000113 . Appears as new, no wear or marking to the five ring binder or pages tho' slightly toned, has the plastic insert to lay flat. Prev owner added a few BH&G recipes from the magazine. I highly recommend the recipe for "Coconut Macaroon Cheesecake" laid between pgs 172 & 173. I copied it and put the clipped one back in.1985 prtg. ; Five -5- Ring Binder; 1.9 x 9.6 x 8.5 Inches; 465 pages . DES MOINES, IA. : MEREDITH BOOKS. VG IN 5-RING BINDER WITH PICTORIAL BOARDS. Pages: 656. . 2006. RING.. PAGES CLEAN, BINDING FIRM. . Condition: VG IN 5-RING BINDER WITH PICTORIAL BOARDS. Pages: 656. Better Homes and Gardens, N.d. Circa 1980. First edition, ninth printing Minor rubbing, near fine and bright. Color photos. Condition: Minor rubbing, near fine and bright. Better Homes and Gardens, 1971. 4th printing. Some soiling to covers, very good. Color photos. Condition: Some soiling to covers, very good. [Des Moines]: Meredith Books, 1970. (USA) 3rd Printing The title page is stained, with the lower edge wavy, a couple of spots to the cover which have a couple of small scuff marks,moisture intrusion to the lower margins of the last 100 pages or som aking them wavy, thus Acceptable used copy; no dust jacket as published. 5-ring binder in red plaid design, 400pp, index. 20 Sectional index-tab dividers; colour photos. 1500 tripled-tested recipes. This book with the plaid cover , appeared in 1953; this new edition dates from 1968; this is the third printing (1970). Over 15 million of this cookbook had been sold by 1971. (3.0 JM FO 46/0. Hardcover, Ring Bound. Acceptable/No Jacket. 4to - over 9¾" - 12" tall. Better Homes and Gardens Books, 1996-08-01. Paperback. Good. Better Homes and Gardens Books, 1997-08-01. 11th Edition. Ring-bound. Very Good. Very Good PLUS BONUSES (please scroll down) A copy that has been read, but remains in very good +++ condition. Pages are intact and are not marred by notes or highlighting. The spine remains undamaged. ***** 3 FREE BONUSES: #1 BH&G's Bread Machine Bounty ~ more than 100 recipes for y our bread machine (spiral bound) ; #2 Time Tested Royal Recipes (vintage looks like from 50s recipe pamphlet 31 pages) #3 The More-For-Your-Money Cookbook ~ you'll find hundreds of recipes created by thrifty homemakers..shopping advice..substitutions to stretch your dollar (1981 recipe booklet) ***** *****MY SHIPPING PLEDGE ***** Orders placed by 4pm CST will be shipped same day. Shipments are packaged by ex-shipping dept., head inside fluted and/or box board. Any other requirements from you, please contact us immediately. USA: Better Homes and Gardens Books, 2007. (USA) Remainder mark to bottom edge of pages, no other markings, there is a 1" split to the rear spine edge at the top of the spine, just breaking the cover paper at that point, upper corners are bumped, about Very Good used copy; no dust jacket as published. Hardcover 5-ring binder, 656pp. Lots of great recipes,cooking tips, celebrity dishes, personal messages of hope. A heavy book. (5.0 JM FO LVR 202/2. 14th. Hardcover, Ring Bound. Good/No Jacket. 4to - over 9¾" - 12". Remainder. Better Homes and Gardens, 2002-09-01. Paperback. Good. 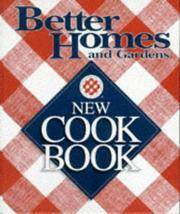 U.S.A.: Better Homes and Gardens Books. Fine. 1996. Eleventh Edition. Glossy Hardback. 0696201887 Oversized 539pp including index and metric conversion charts Internal spiral binding to pages will lie flat when opened Over1,200 family-favorite recipes Over 500 color photos Rear cover is scuffed . Meredith Books, 1996. This is a beautiful and well-kept cookbooK: Classic BHG themed hard boards; 539 pages; ring binder is perfect; no marks; text block and photos are clean and bright; eleventh printing; title page ring holes are worn but reinforced nicely with clear tape; "Since 1930, home cooks have turned to Better Homes and; Gardens New Cook Book for guidance in the kitchen. This new edition includes more than 1,200 recipes, 1,000 color photos, and more tips and how-to information than ever. The Secrets to Success feature in each chapter shows cooks the key ingredients or steps to making each recipe successful. ". 5 Ring Binder. Fine/No Dust Jacket as Issued. 8vo - over 7¾ - 9¾" tall. Book. np: Meredith. G ring binder. (1962). 5th ptg. Red and white crisscross binding, black circle title. Edge wear, split along spine edge near bottom. .